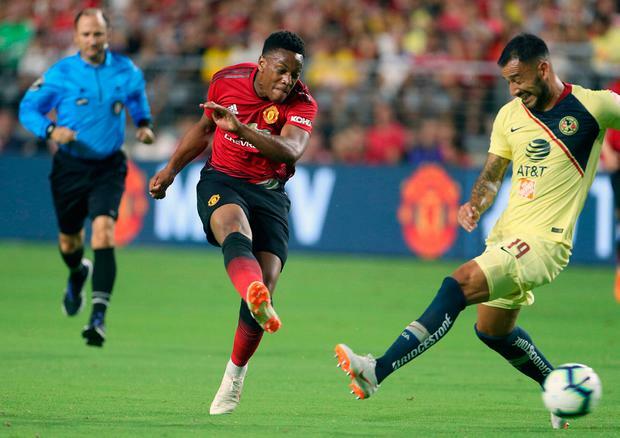 Jose Mourinho expected Club America to put his new-look Manchester United squad through their paces - and his prediction appeared to be realised in the 1-1 friendly. Missing star talents Paul Pogba and Alexis Sanchez, the opening match of a pre-season US tour looked like it might end in defeat for the Reds in Arizona until Juan Mata volleyed to equalise in the 78th minute. Mourinho told MUTV: "After five days of training you need to play and it's good to play against a team that is at three days' distance from starting their Mexican league. "So (they were) a team with with intensity, a team with quality that pushed us to levels that we are not prepared for... so a good training session." A goal-less first half at the University of Phoenix Stadium saw new signing Lee Grant make two saves, while United appeared to struggle to zero-in at the other end. Anthony Martial and Mata came close, although none caused Club America stopper Agustin Marchesin too much strife. Mourinho made two changes at the break, replacing Grant with Joel Pereira and switching captain Antonio Valencia for Timothy Fosu-Mensah. Club America got the better of United in the 59th, Henry Martin finding the net with a stunning header off a cross by Antonio Lopez. Luke Shaw made a follow-up attempt after play resumed, going wide to the right, and United went more than 15 minutes before another opportunity arose. It looked to be another miss, Ander Herrera striking the left post with a header, but Mata was waiting at the side of the box to power the volley home. United's next stop is in California, where they will play San Jose Earthquakes on Sunday. Pogba is having a post-World Cup break and Sanchez did not fly out with United at the weekend because of what the club said was a "personal administrative issue". New signing Fred, along with Sanchez, is expected to join the squad next week.